My sixteen (16) year old cranky cat "Cookie" was in such good spirits when I returned from Hawaii I knew she was well taken care of. Burt cleaned up after her and left presents for Cookie & I, you made me smile. Thank-you Burt, you are the best !! Ill be using your service again. Burt West of “Ronni West's Happy-at-Home Cat Sitting” is absolutely the best! We found our baby, Gracie, in the bushes March of 2013 and soon thereafter needed a sitter for our times away from home. The 1st pet sitting company I contacted, the owner was on vacation and it took him forever to call me back. Not Burt & Ronni! They really go above and beyond and I’ve been using their services ever since-4 years now! The personal attention given to Gracie is remarkable. Not only does Burt feed her exactly according to my instructions, but also cleans up after her impeccably. He spends a lot of time playing with her and spoiling her so she doesn’t feel lonely. I also receive a detailed text, each day, with pictures and videos! He even asks if I need him to do anything else (like bring in my mail or water my plants). It’s a comfort to know Gracie and my home are in the best of care!! Thank you, Burt, for taking the worry out of leaving home! in mail, watered plants, and also called me each night to report on the cats. Wonderful, Wonderful service. What a relief to know that our cat will not only have her basic needs taken care of, but she will be adored while we are away. Ronni goes above and beyond. This is the first time in the last few years that I have been comfortable leaving an only cat home alone. Burt did such a wonderful job filling in for his wife Ronni. Luna received love and playtime as well as food and a clean box daily. I am grateful for the text message and pictures of her I received while away. This attention to detail made my trip away much more enjoyable and stress free for me. We have been home three days and she still looks for Burt to play red dot....amazing. Happy cats!!! Ronni is very thorough in addition to being a cat lover. You can go away and know that your beloveds are in the best possible hands. We would like to thank Ronni West ‘s Happy-At-Home Cat Sitting and especially Burt for the excellent service they provide. Burt does an amazing in-take of your cats needs (health history, vet, hiding places) and any home services required (mail, newspaper, trash, etc). We felt very secure in leaving our cat Maggie in safe and loving care on our recent trip. Burt sent daily text messages and pictures on how Maggie was doing – it was a very reassuring communication. Maggie was a very happy camper upon our return and the house did not smell like “stale cat box”! We will be using Happy-at-Home again soon. It is a great service. Ronni. Came and took care of my cats and when I came home, my cats looked at me as to say who are you? And where is Ronny she is great! Ronni is wonderful with my 4 cats. She always goes above and beyond the call of duty to make my cats happy. She always checks in to let me know they are safe and sound so I never have to worry when I am away. I would recommend her services to anyone. Ronni gives excellent care to my 3 cats. They all love her and look forward to her visits. I so appreciate coming home to relaxed, well-cared for kitties. Ronni gives them play time and will introduce a few new things like crumpled paper as a new toy to stave off kitty boredom. I do believe she has her finger on the pulse of their well being! Wanted you and everyone to know how pleased we were with your services when you ( Burt ) cared for our kitties. Burt came to our home in advance and spent time with us getting to know our kitties and what we needed done in our absence. We truly felt comfortable right from the start letting you into our home and putting our kitties in our care. Thank you again and I know we won't hesitate to use your services again. Ronni took care of our cats for 9 days and did a wonderful job. She quickly figured out their preferences in play and attention, she told us when she'd be visiting and when she'd call, and her messages were filled with delightful details. She is professional and caring, everything you could want in a cat-sitter. Just wanted to add another vote for Ronni. She's taken care of my cat on several occasions. The first time I went on a trip, when I got home and opened the door, my cat seemed pretty disappointed it wasn't Ronni! I have used Ronni's services twice now for my cat and think she is the BEST pet sitter ever. She is very professional and caring and even took the time to call me about how he was doing. I highly recommend her services. We learned about Happy-At-Home Pet Sitting at our vet's office through a brochure. Burt and Ronni have followed up with us promptly every time we have called them to inquire. Burt took the time to discuss our cat's habits and schedule. Another great part of their service is they help with other household needs such as picking up mail and watering plants. Burt was professional and thorough with our cat and the house. I can't tell you how thrilled I am I found Ronni & Burt. I was impressed at how thorough she was at our 1st meeting and I knew then, Gracie & our home were in loving hands. Our cat was a stray we adopted and we did not know how she would react to our leaving her alone for several days. Having someone, so loving and caring, made all the difference. Ronni gave her plenty of play time and introduced a few new things like crumpled paper as a new toy, (what a great idea) as well as the organic catnip spiced bubbles. The daily updates were a welcome relief. When we got back, Gracie was relaxed and not at all stressed that we had been gone. Not only was Gracie loved & cared for, so where our plants and our home. They are professional and caring. Everything you could want in a cat sitter. Thank you for going above and beyond. I highly recommend Happy-At-Home Cat Sitting. l animals. Thank you, thank you, thank you!!! Bella, Cosmo, and Claire say thank you for taking care of them too! They act like we didn't even go away! I couldn't be more pleased! Ronni develops a personal relationship with your cat. Professional, caring and warm. Rarely do you get an opportunity to work with someone who has found the perfect job for herself. Ronni treats all her feline clients as her own cats. Always professional, a great communicator, always loving. She's the best! We cannot thank you enough for the wonderful service you provided. Burt, you did so much more than we would have asked. The paper, the mail, the trash cans, the plants, the catnip, THE CAT BOX and playing with Tabitha, wow! It was such a relief to find you, as we did, at last second. Knowing that we can rely on you in the future opens us up to take more remote work for our business. Who could know that eting you would help our income too? Dr. Durland and the folks at Les Bois Veterinary spoke very highly of you and they were right to do so. Thank you again. We will talk to you soon. We couldn't have been more pleased with the professionalism and care Ronni gave our cats. They didn't seem to miss us at all-"oh, you're home". Our kitten had recently been neutered so I was concerned, but Ronni asked all the questions that made me feel very comfortable leaving them in her care. She's the best! Ronni West's Happy-At-Home Cat Sitting is the best! If you need a Cat Sitter, call Ronni! My Kitties love her & we will call Ronni again for her wonderful Cat Sitting Services! I am sending you my long overdue thank you for taking such fine care of my Sophie. It is always hard to leave her since she is so spoiled and sensitive but when I got back I could tell she handled our absence better than normal thanks to your care. I appreciate the extra time you spent with her and your keeping in contact with me during our trip. I can tell you are a true cat person. It is a comfort for us to know we have a wonderful catsitter close to home to care for Sophie while we are away. Please feel free to use me as a reference.I would be happy to give you a glowing recommendation. Thanks again.ing hands. She calls/leaves a detailed message of every visit and she spends time playing with them. I highly recommend her services! Excellent!!!! Ronni is conscientious and trustworthy. She taught me things I never knew about caring for cats! She showed up every day, as she promised she would. Upon my return, the house was tidy and in order, and the kitties were not too excited to see me, as Ronni is much more fun than I am! My kitties and I highly recommend her! I am new to the area and was referred to Ronni and she has been absolutely wonderful. I have called upon Ronni several times and with short notice. She is very reliable and handles my very temperamental kitty better than any other sitter I have used in the past eight years. I would highly recommend Ronni and Happy at Home Cat Sitting. Thank you Ronni! Ronni is hands down the best catsitter that I have ever had! When you first meet with her, she is extremely thorough with learning everything about your pets. I immediately felt at ease and knew that I didn't have to worry about my kitty boys whenever I traveled. What impressed me the most was that she took the time to call or text every day after each visit. cat-sitters! Thank you Burt and Ronni! I fear that Ronni may take better care of my cats than I do. She is an excellent catsitter - professional, reliable, and caring. During her visits, she spends her time actively engaging our cats in multiple activities - playing with bubbles, chasing the laser pointer, snacking on organic cat nip. She also has a knack for coaxing even the most timid cat out from hiding. Upon the recommendation of our vet, we hired Ronni to look after a new family kitty. This was my first time hiring a pet sitter, yet I know this was not your run-of-the-mill experience. Ronni loves animals. It shows in everything she does. In her detailed approach, in her gentle manner and in the way animals seek her out. I honestly could not recommend Ronni more highly. Go on vacation...your kitties will be in very, very good hands and so will your home! I cannot believe I let this much time go by without sharing how wonderful Ronni's services are! I have called on her a bunch of times since I adopted my 2 cats in 08 & 09, and she has always worked out wonderfully! When I get home they are happy, content and relaxed and the place is in tact. :) I miss them when I'm away but I'm never worried about their well being when they are in Ronni's care. I highly recommend Ronni West's Happy at Home Pet Sitting service. We recently went on a five-day trip to Washington and I called Ronni's service to arrange for cat care. Although Ronni was out of town caring for her mother, Burt, her husband, was happy to come to my home and explain the details of their service. Not only did he spend time getting to know my cats but he asked lots of questions about their routines, personalities and habits. He came to my house every day during my absence and gave my animals personalized attention. Not only did he feed them, change their water, and clean out their litter boxes but he also visited with them and entertained them with various cat toys. In addition, he brought in my mail and newspapers and made sure my home was secure. He definitely went beyond what I expected and I appreciated his dedication to providing first-rate service. Thank-you again. Ronni is the Mary Poppins of cat sitters. My four cats absolutely love her! I sometimes suspect they try to get me to go on trips so they can see Ronni. Not only do the cats love her, but I never worry when Ronni's in charge. She is completely and totally reliable and so careful to take good care of my babies. I've had many cat sitters over the years, but Ronni is the absolute best! Ronni could also call her service peaceofmind.dot com. We have used Ronni's service for the past 4 years and she has never failed to exceed our expectations. From providing the basics including feeding, watering, and ensuring a clean litter to providing personalized play time, we are confident our cats will be happy campers while we are away. The daily status updates are especially appreciated and allow us to relax during our time away from home. The crumpled paper as play toy was also a big hit!. We highly recommend Ronni and her Happy-at-Home Cat Sittiing service. When my husband and I moved a year ago I was tentative about finding someone to watch our cat when we go out of town. We seem to be gone about once a month. Ronni's website the only one that intrigued me enough to call and meet her. At our first meeting I knew it was love at first sight for our 2 year old male cat. Our cat has some neurological issues (walks a little crooked) and needs someone sensitive when playing with him. Ronni IS a cat whisperer! She has even given me ideas on how to play with him. Our cat and house are always in great shape when we arrive home and the phone calls to "check in" are so reassuring. Simply put: she has given us the ability to relax and know that our cat is truly "Happy-at-Home"! I would like to take this opportunity to share my experience in using Ronni West’s Happy-at-Home Pet Sitting service. My wife and I recently had Burt West, Ronni’s husband, provide at-home care for two of our three cats, and two things in particular became evident after our experience with Burt. One is that he is a true animal lover, and treats your pets as if they were his own. The care he provides is second to none, and your pets will have found a true friend who attends to their physical as well as their emotional needs. Pet sitting is Burt’s top priority, and it is truly wonderful to find a pet sitter who so obviously loves his job. The second item of note is that Burt is a true professional in the field of pet sitting. His attention to detail is exemplary, and he will take care of things that even you may not have thought of in planning your time away from your home and pets. I would like to conclude by saying that I would not hesitate to use Ronni and Burt’s pet sitting service again in the future, and I would strongly recommend that any prospective clients also consider using them. PS – please feel free to use this email in the “Testimonials” section of your web site. Ronni is everything that she advertises to be and more! She has been our cat sitter for 8 years (since the start of her pet sitting business) and knowing that she is looking after our cats while we're on vacation gives us absolute peace of mind. She has an incredible rapport with cats and has a gift for being able to coax out even the most timid and shy cat. She runs an extremely well-organized and dependable cat sitting service. Our cats LOVE her. You can tell that Ronni loves her job and is extremely devoted to her clients because it shows in her outstanding caretaking. We would never hesitate to recommend Ronni. ​Ronni is just magic. We have a very problematic aggressive cat who cannot tolerate any strangers in the house. Ronni was the only one who could tame the beast. She didn't only take amazing care of our boy, she taught us how to play with him and calm his down. She invented many engaging activities for our cat and really dedicated lots of time and effort to get known him better and understand his personality. We couldn't find a better cat-sitter ever since. We miss you so much! We were gone for ten days over the holidays and we met Ronni and hired her to care for our two cats during this time. She's a cat whisperer! My cats were so mellow and very content when we returned. They were clearly well cared for. Ronni is very organized and professional. She comes for an initial visit and takes down info about your cats, your trip, the needs around the home while you are gone. She not only took great care of our kitties, she watered our plants and even came Christmas Day and brought our pets a gift--we are really grateful to her. We had complete piece of mind while we were gone, which made our trip very relaxing. Honestly, I think she took better care of our cats than we do! She's awesome. We can definitely and enthusiastically recommend her to anyone who needs cat sitting. Burt, just wanted to let you know how grateful we are to have stumbled on to your Happy-At-Home Cat Sitting service. We are new to the area but needed to take a quick trip out of town. We have three cats that were adjusting to their new home and we didn’t want to just get the next door neighbor to run over and feed them. More than that, it would be a great imposition to ask them to clean the cat box! You arrived for a consultation and I knew immediately that you not only cared about the kitties but would take great care with them and the house. While we were away, you bonded with the youngest cat, Indy, but to our chagrin, the older two cats were hiding – their loss. No matter, you took care of them trying to coax them out. I think that the next time you come, they will show themselves to you so they can be spoiled just like you spoiled Indy. In fact, about the same time every day since we’ve been home, Indy comes around looking for the bubbles, laser light and catnip wondering where Burt is, lol. cats, cleaned the CAT BOX and even went beyond expectations by helping us keep our water lines upstairs from freezing by running water and flushing the toilet. Burt, you made our trip worry free as you would text and send pictures each and every day, very much appreciated. Thank you so much! Ronni is great! She came over for an initial visit and stayed for a while just getting to know the cats and having them become familiar with her. She brought over a "bag of tricks" to spark our cats' curiosity. We have 2 cats and one of them is pretty shy. Within 10 minutes, Ronni had our shy cat out from under the bed and rolling around on the floor sniffing the catnip Ronni had brought. Ronni called us every day we were gone (about a week) to give us updates on the cats. When we got back, our cats were definitely relaxed and not at all stressed out that we had been gone a week. We will definitely use Ronni again--I think our cats miss her! Ronni has been my cat-sitter for four years and she is incredible; professional, absolutely reliable, and above all takes excellent care of my cat. I call Ronni, go on my trip, then come home to a relaxed purring kitty who rolls on her back expecting the 45 minutes of petting she's been getting from Ronni. If you want to leave and not worry about anything, I would definitely recommend her. Ronni has been caring for my cat for a few years now, and she is just the best. I never really felt like I could take a nice long trip before I met Ronni, since I really wanted the best care for my cat while I was gone. I no longer worry about that, now that she is in Ronni's care while I am gone. I always return to a happy, purring kitty, with lots of notes about what she has been doing while we were gone. We brought our two new kitties home from the Humane Society just two months before we had to leave on a 10-day trip. Calli and Edna are both 5-year-old calico females. They were strangers to each other and everything was new. There were a few issues for sure. We definitely didn’t want to put them back in cages, so we asked our vet if she had recommendations for sitters. Luckily she gave us the name of Happy-at-Home Pet Sitting. Ronni was out of town so Burt, her husband, came over and met Calli and Edna. From the beginning it was clear the cats agreed on at least one thing: they liked Burt. Burt was very concerned about making sure he did everything we would do for the kitties. He was very security-conscious as well. Every day we received an email update along with pictures of Burt visiting with Calli and Edna. When we returned the “kids” were happy and content. I think we will be travelling more, knowing we found such a wonderful resource in Happy-at-Home Pet Sitting. Thanks, Burt. You’re the best! Calli and Edna agree. We and our kitty boys were absolutely thrilled to find Ronni. I was really impressed with how thorough she was during the initial consultation and knew we didn't need to worry at all while on vacation. We also really appreciated Ronni's phone calls letting us know how our kitty boys were doing each day. She took excellent care of them from feeding to grooming to playing. We will definitely use Ronni again, she is the best! Ronni West is THE best cat and home sitter I have ever encountered. I have used her services for the past 3 -4 years. The most recent time I had to be away for almost 7 weeks. Ronni took care of my cat daily, sent me email and phone updates. She took in the mail, changed around the lighting and drapes, picked up all the mail and newspapers, watered my outside and inside plants, and of course cleaned the litter box. I had an emergency where I needed my passport from my desk, and one call to Ronni, she found it and Fed Ex'd to me. Everything with Ronni is just handled. Before I came home, she even vacuumed the entire house and swept the front walkway for me. She goes way beyond the call of duty, is exceptionally reliable, LOVES my cat, plays with her (more than I do) and gives me complete confidence to be away from home knowing everything is taken care of. I have never met anyone more dedicated to her work, my cat, my home and my comfort while away. Hire her, you won't be disappointed. I can now relax knowing that I have a trusted cat sitter I can really rely on. Could not recommend her more. Ronni West is the best! We have been extremely satisfied with her home cat sitting service for many years and have no doubts about the care and attention our two kitties, Nino and Nova, receive while we are away. We are without worry or concern while traveling (yes, peace of mind for us is a factor too! ), in addition to the fact that the cats look forward to her visits. Her daily check in messages are comforting to hear. A couple of years ago while in Europe for three weeks, one ours became ill, it was an emergency, and Ronni spent hours at our vet's office with Nino, as well as consulting with me in the UK in the decision-making. We will be forever grateful for her noticing the onset and follow-up of Nino's care until we returned home. I was referred to Ronni West Happy-At-Home Pet Sitting through the Cat Doctor. I will start by saying when it comes to my pets I am very overly protective of them. I know most people would say they are too but I am what my family and friends consider “over the top” in this area. So to consider people that were not family or friends watch my pets was quite a stressful decision for me. However, I would soon discover that my stress was unnecessary. I talked with Burt on the phone at first and he gathered a lot of information about the cats and their personalities. We then set up a time for him to come over and meet them. He went over feeding schedules, personalities and quirks, any medical issues and what to do in emergencies. Lucien loves everyone he meets even the person who may come to check out the furnace so no surprise that he took to Burt right away. Ramses is a little more selective in whom he likes, but he too went straight to Burt as if he had known him his whole life. Cleopatra is my shy girl. She takes a long time to warm up to anyone, even with my own mother it took months. Burt had spent time talking with her trying to get her to play. She would play once in a while but she didn’t want to get to close. Imagine my surprise when before his visit was up she was out AND letting him pet her. Not a lot mind you but ANY contact was a shock for me! I thought ok if he can get her out of hiding within minutes of being here there is no need for me to be concerned. When it was time for Burt to come back and take care of them I received pictures, texts and videos of how things were going. It was nice to be able to see they were enjoying their time with him and well taken care of. When I returned home they seemed disappointed that it wasn’t Burt coming to play again! It is also a nice feeling when I call no matter if it is after a week or month, each time he knows my name and my pet’s names as well. I would definitely recommend them to anyone without hesitation. I feel like they cover a lot and care about your pets as if they their own. Thank you for taking great care of my furry children. Excellent cat sitter! I used Ronni's Happy-At-Home Cat Sitting for the first time a few weeks ago. After talking with several pet sitting services that I wasn't impressed with, I spoke with Ronni and knew I'd found my cat sitter. Ronni is wonderful! She is very responsible and took great care of my cat Marmalade. I appreciated the calls about how her visits with Marmalade were going and Marmalade loved the catnip she brought over. I returned home to a happy, purring kitty. I would highly recommend her services! Ronni-- Our kitties love you! I was nervous about leaving them since we had just moved into the area and didn't know anyone. But you reassured me right away that they would be loved, cared for, and played with while we were gone. And they were! The cats never seemed so relaxed. When we got back, they were calm and it wasn't like we had been gone at all. We will definitely call again. I know Simon and Zooey miss you! Ronni did such a great job taking care of our two new cats just adopted and are 2 years old. I was surprised at how happy they were when we arrived home after 3 days of Ronni's care. The loved her home grown catnip and we got messages from Ronni about how they were to make us relax during our 1 year anniversary getaway. She is wonderful and truly loves her work. I'm so glad I found Ronni to take care of my old girl Thea! My cat is 17 and needs daily medication now and I was concerned about leaving her for a full week in the care of some neighbor kid who might be forgetful, or not as attentive as I'd hoped. Thea is also a solitary pet and knowing that Ronni was giving her attention and loving play time was really important to me. The notes about her visits with Thea every day were also wonderful to read, the little details really made it clear to me that Thea wa absolutely in the best care possible. Thank you so much Ronni! My husband and I were very nervous about leaving our five boy kitties for the first time. The longest they had ever been without us was eight hours during the workday, and I didn't know how they would handle our short vacation. I was especially worried about Mr. Boo. He doesn't let anyone touch him except for us. During our first consultation with Ronni our fears were relieved. Our kitties flocked to her and let her pet and love them all she wanted. By the time we got home Mr. Boo was purring like crazy and rolling over on his back to let Ronni rub his tummy. I don't know how she does it, but Ronni has a way with felines that is to be admired. Our boys acted as if we had never left. We couldn't thank her enough and are now not at all nervous about going away again. We know our babies will be in good hands! I feel so lucky to have found Ronni's Happy-At-Home Cat Sitting Service. I have a 12-year-old kitty - my big baby - and traveling at the holidays has always been an issue. I can't stand to leave him, but my family lives in another state. This year, I found Ronni. This was the first Thanksgiving that I was able to leave him worry free. Obviously, I missed him terribly, but knowing that he was in THE BEST of care with Ronni made my holiday with my family so enjoyable. She made sure that he got his medicine everyday and opened the patio door to give him fresh air and gave him lots of love. Ronni is such a loving person - my little Raider was in the best of hands. She even introduced him to the "laser pointer" - it was such a kick to watch him chase it. Thank you, Ronni, for taking such great care of my little boy. He can't wait to see you at Christmas! I appreciate you so much. My husband and I are always nervous to think about leaving our 2 kitties home while visiting family out of town. Since our cats love playing, we are concerned that they get bored without play or human interaction. We called in Ronni to help. On Ronni's first visit (consulting visit) we could immediately feel how much Ronni loved cats and how much Ronni enjoys her job (taking care of cats). After watching Ronni play with our cats we felt comfortable to leave them in Ronni's care. After we got back home, both our cats looked great; they had been taken care of very well. Also, we found daily notes that described how the cats were doing every day. (And they got a new toy too.) Later, Ronni sent many pictures of our cats as plaful and enjoying as if they were with us! Our cats really loved having Ronni take care of them. Thanks so much for a great job! Having my cat for seven years, I have formed a very close relationship with her. I would prefer not to leave my cat home alone with someone who just treated her care as a job. Ronni takes care of my cat using as much of my routine as possible, sharing her love, kindness, and knowledge to minimize the effect of my absence on my Alie cat. Also, I like that Ronni keeps a daily diary for me of how Alie behaved on each of her visits. It is because of her care that I can travel knowing my cat will be well cared for and I usually check to make sure Ronni is available to watch my Alie cat before I make my travel plans. I don't think I could recommend a service such as Ronni provides any more highly than I am attempting to do in this review. The bottom line is that she takes care of my pet as if was her own special cat and that comes across in the playing and treats that she shares with my cat when she is watched by Ronni's Happy-At-Home Cat Sitting. Kudos to Ronni for a real quality service for these little creatures that can bring us so much joy and companionship with just a little love and effort on our part. I used Ronni West's Happy-At-Home Cat Sitting for the first time about a month ago and both Graycie the kitty and I were very pleased with the service. Ronni was very professional and personable got along well with Graycie. I was impressed with the excellent questions Ronni asked about Graycie's likes, dislikes, and our routine and especially appreciated the daily calls I received about how Ronni's visits with Graycie were going. 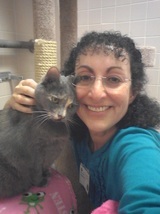 Graycie is a very affectionate, human-oriented cat, so having someone like Ronni who really cares about meeting not only a cat's physical needs, but also their emotional needs, was especially important. When I returned home from my trip the house was in order and Graycie was happy. After mixed experiences in the past with friends who have watched Graycie (and with the growing discomfort of putting my friends out for help), it has greatly eased my mind to find Ronni. I travel regularly for work, but now I might even consider taking a trip for pleasure knowing that both Graycie and I could have a healthy and happy time! When going out of town since I have to leave my cats at home. I usually spend my entire trip worrying about my three furries, and wondering if whoever I've left to care for them will actually spend time with them or just run in, feed them, clean the box and leave without making sure they're all ok. Paranoid? Yes, but these are my babies. As soon as I met Ronni, during our consultation appointment, I had a good feeling about her, but it wasn't until my husband and my first night in Kauai that I realized I could finally take a vacation. Ronni left me a voicemail, as she did every night until our return, giving us a detailed update on how our kitties were doing, complete with hilarious and sweet anecdotes of their playtime together. It was so reassuring to know that someone wasn't only taking care of their base needs, but really spending quality time with our cats and, more importantly, tiring them out so they didn't cause any major destruction in the house due to their cabin fever. When we got home our house was spotless and our cats seemed very content. I would actually even go so far as to say that the very next day they seemed disappointed that Ronni didn't show up at her regular time to play with them. Ronni's prices are incredibly reasonable, especially considering the amount of time she spent with the cats. I actually want to go out of town more. I cannot say enough about the quality of service we received from Happy-At-Home this past September. Having just moved to the area, we were really nervous to leave our cats while we traveled south for my husband to do some research- but from the very first meeting/consultation we were immediately at ease. Our cats were given an individualized care plan- complete with information about their playtime and treat preferences and Ronni even suggested some games for our kitties that they might enjoy. They brought over a plethora of activities and snacks and spent time getting to know us and the kitties- Ronni was like a cat whisperer! While we were gone we received regular phone calls to tell us how our cats were doing and this really made us feel comfortable being away, knowing our kitties were in good hands. As mentioned in other reviews our cats seemed thoroughly disappointed when we returned...we could tell they missed their wonderful cat sitters! I recommend Happy-At-Home without any reservations. Our cats were completely cared for, cuddled, and loved and we came back to a great looking home as well. Thank you so much! My cat Feathers is a feral who in 15 years does not allow anyone else near her. She hides when people come inside and has never bonded with anyone but me. She would not eat for anyone else or use her box, she simply hid under the bed in fear. Years ago I was fortunate enough to meet Ronni and her husband. For many years prior I was afraid to leave my cat for vacations. Ronni has such a phenomenally loving understanding of cats, I knew she was the person to watch Feathers so I can finally get away for much needed vacations. I had never met anyone before Ronni that loved cats as I do and understood their personalities. Ronni had worked with many ferals and understood their fear based needs. Ronni worked over time gently earning her trust. She brought homemade catnip, fresh from her garden. She brought treats and toys. She sang to her and quietly encourgaged her with a soft voice to come out and eat. She knew Feathers preferred quiet and she sat quietly while my cat finally came out to eat in her company. Now Feathers will come out of her hiding place to visit with you.. In 15 years no one else has been able to pet this cat, that is the most amazing progress. I never cease to be amazed when Ronni calls me on vacation to tell me of her continued progress. Ronni was able to bond with Feathers which shows that Ronni has exceptional skills and love for our pets. Ronni has gone the extra mile and shown great love for my cat in how she cares for her. I highly recommend Ronni West for your cat sitting needs. Her exceptional loving care of my cat is the reason Ronni is the only person I trust with my cat and my home. Her attention to detail is remarkable. In closing when my Mother was dying and I had to be away I was able to count on Ronni for several weeks. I knew my cat and my home were safe in her hands. Ronni's care surpassed cat sitting. To Ronni her clients and our cats are treated as family. I am proud to recommend Ronni West as your cat sitter. Your cat will thank you. Well done Ronni. Bonding with my cat is the ultimate recommendation! In late January, we adopted a 5-year old and a 7-year cat. They had both been in the shelter system for several months. Two months following the adoption, we found that we needed to be out of town for a week. It just seemed wrong to take them to the vet, where they would again be kenneled (just like at the shelter). We found a review for Ronni and gave her a call. In addition to taking care of the "necessities", Ronni spends time playing with them and petting them. Upon our return, the cats looked great, there was no odor in the house, no scattered litter on the floor, empty food cans had been rinsed and were in the outdoor recycling bin, litter waste was bagged and in the outdoor trash bin. As others have mentioned, Ronni will bring in the mail and newspaper, water plants, adjust lighting, drapes, etc. In addition to great pet care, it's good to know that if a water pipe breaks in the house (or some other household disaster occurs) someone will be there to notice it within 24 hours -- much better than going unnoticed for possibly as long as two weeks!!! We called Ronni again for our trip in early August. So we have used her service for 20 days during the last five months. We will call her again, the next time we need to be away from home and we highly recommend that you call her, as well. The kitties actually seemed to be disappointed when we returned home last night - I guess Ronni is much more fun than we are !! !ith Ronni! She will even let Ronni pet her. For this cat, that is the most amazing progress. I never cease to be amazed when Ronni calls me on vacation to tell me of her continued progress. Ronni was able to bond with Feathers which shows that Ronni has exceptional skills and love for our pets. Ronni has gone the extra mile and shown great love for my cat in how she cares for her. I highly recommend Ronni West for your cat sitting needs. Her exceptional loving care of my cat is the reason Ronni is the only person I trust with my cat and my home. Her attention to detail is remarkable. In closing when my Mother was dying and I had to be away I was able to count on Ronni for several weeks. I knew my cat and my home were safe in her hands. Ronni's care surpassed cat sitting. To Ronni her clients and our cats are treated as family. I am proud to recommend Ronni West as your cat sitter. Your cat will thank you. I can not say enough things about Ronni & Happy At Home Cat Sitting. Ronni's number one priority is your animal and you and to make you feel as comfortable as possible leaving them in her care. This was the most important factor in choosing a caregiver for our boys when are out of town as we had a terrible experience prior to moving to . My husband and I are very particular when it comes to leaving our boys (2 male cats) in the care of a sitter. They had a very traumatic experience when they were 5 months old in which the cat sitter in another town came for 1 day to pick up her check, never to be seen again. Needless to say they were traumatized and lost weight with no food and little water for 5 days. When we moved, we were not excited at the prospect of going out of town because we would either have to, board the cats (which they hated), leave them on their own (which we all hated) or find a cat sitter. We looked around and found Happy-At-Home Cat Sitting. From the moment I made the first call and spoke with Ronni's husband to set up a meeting so they could meet our cats as well as us, I knew it was a perfect match. I told them about our previous experience and they went above and beyond to make us as comfortable as possible with leaving our boys in their care. They spent a good deal of time playing and bonding with our cats while we sat and discussed Ronni's services. Ronni is very reliable and organized in everything she does. She has thought of a million things that I never thought of, including having on file all of your cats vet information, emergency contact information, as well as where you keep extra food and litter, etc. She treats your cats like her kids and it's very evident once you meet her and see her with your animals. We no longer get anxious when we leave town, we are so comfortable leaving Ronni in charge, we can actually enjoy ourselves. Ronni also, at our request, calls us after every visit to let us know how our boys are doing. We hands down would recommend Ronni's services to any pet parent!